Punch-drunk from a series of crunching blows, dazed and confused, staggering for the ropes. It’s hard not to get the image of Bitcoin being pummeled by the market, getting the wind knock out of it. But is this picture true? Instead of focusing on what swirls around in the media, a cautious investor would instead reach out for what might drive their profits. It’s always tempting to associate moves in the market with pieces of information coming in from the media. This is a tenuous relationship at best but the real question is if this has got anything to do with Bitcoin and if it could increase the profits on our hypothetical positions. Let’s break this down. If Bitcoin doesn’t really react to the news of a Google ban, then it might be best for our readers to look at the short-term picture and sense the waters this way. If, however, the current move is linked to the ban, we possibly have an important indication on our hands, one which extends signs we saw a couple of days ago. As it turns out, whichever interpretation is correct (influence of the ban or complete lack of impact), both points of view lead in the same direction. On BitStamp, we that the situation has deteriorated for the currency. Looking at the prices, we have seen a move from almost $12,000 to around $8,000. Dramatic as it might seem, this is not unheard of in the Bitcoin market. We have seen more significant moves down in the past, so this is not something which would make the situation completely different. 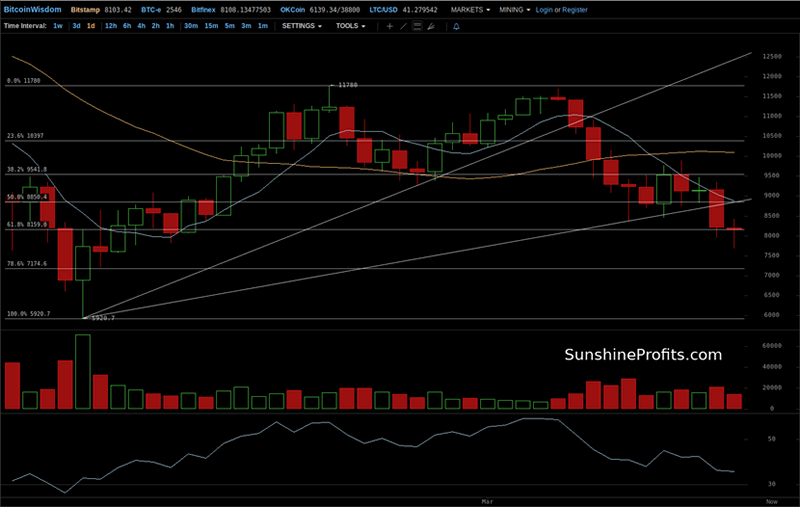 Bitcoin is well below the rising very short-term trend line based on two February local bottoms (steeper line). This is a clear suggestion that the previous rebound might be over. Additionally, we now can draw yet another resistance line based on the Feb. 6 bottom and the Mar. 9 low. Bitcoin is visibly below even this latter line, which in turn implies that the pace of the decline might be picking up. From the perspective of the Fibonacci retracements based on the last serious move up, we see Bitcoin below the 38.2% retracement and in fact almost exactly at the 61.8% level. This means that we the short-term implications are bearish. We might see a small pullback from the 61.8% level as Bitcoin is testing this level and hasn’t convincingly broken it but this doesn’t change the short-term picture. Granted, the two lines and the Fibonacci retracement are of a short-term nature, but it is the short term that we’re speaking about now. And we do have another possible indication we have already mentioned. If we consider the Google ad ban as having impact on the market, then it does seem that Bitcoin is now reacting to negative news. This is an extension of what we saw when Bitcoin went down shortly after the negative news from the SEC. To cut a long story short, Bitcoin is now potentially reacting to negative news in the “conventional” way. This means that one of the most prominent bullish indications previously present in the market is now no more. On the long-term Bitfinex chart, we see that we can now draw three declining trend lines based on the Dec. 17, 2017 top and: 1) the Jan. 1, 2018 top, 2) the Feb. 20 top, 3) the Mar. 5 top., with each line lower than the previous one. It is important for your trading to notice that Bitcoin is now below the lowest of these lines. The lowest line is not yet convincingly broken but, this notwithstanding, we read this as a bearish indication and one important for the medium and long term. The move which has brought Bitcoin below the lowest trend line has also brought the currency below the 78.6% retracement level. 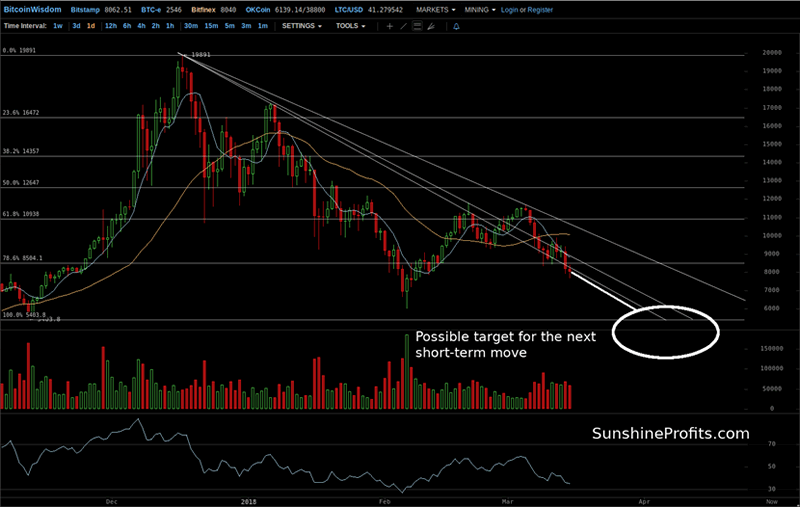 This means that if this move is confirmed, we might see a drop all the way to the $6,000, or even lower. In this context, the situation is even more bearish than it was a couple of days ago. Given the recent depreciation, we might see a pullback to the upside or a test of the 78.6% retracement. Tempting as it may be to get out or even go long in an anticipation of the pullback, there might simply be no time to get back in at high enough prices. To answer the question from the title: No, Bitcoin hasn’t bought it, but it might take a serious hit in the weeks to come, boosting profits on our hypothetical positions.